The Canterbury is a wooden piece of furniture specifically designed for storing sheet music and music books. They typically consist of several racks that music slides easily into, a bottom shelf for storing larger items, and a removable tray. 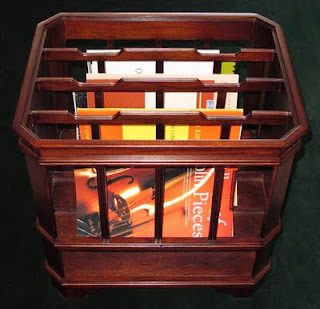 Many also have handles, making them one of the classiest ways to transport music. 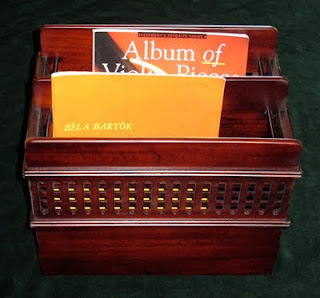 The highly musical President, Thomas Jefferson, used a Canterbury to store his own music, and you can still see a picture of it here. At Fein Violins we offer two styles of Canterbury, one larger and one smaller. Both are crafted of solid Mahogany and look great as furniture pieces. Check them out here. If you find yourself with untidy stacks of sheet music or a bag full of miss-matched xerox pages, perhaps you should consider picking up a Canterbury and simplifying your life. I know my mother could use one, and next time I need a gift idea for her I might get her a Canterbury - she could use a place to put all those copies of "Ode To Joy." nice post . It is looking very nice.